Yes, Carmen, real men do wear pantyhose, and we are not talking cross dressers here. Attention, Metrosexuals everywhere -- Mantyhose have crossed over the pond. Mantyhose are the HOT new trend in men's fashion in Europe. This trend is just hitting the U.S., with one store in Granville, Ohio, selling them. I would have thought the trend would hit New York first, but I guess there is a male fashionista out west. Mantyhoses can be ordered online, and they come in all patterns, including checks, dots, crossword puzzles, and my favorite, barbed-wire. (I would love to see a cowboy in those!) And, you can even order designer styles from Emilio Cavallini for $40 a pair. 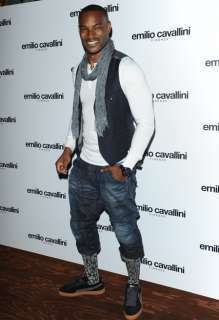 Tyson Beckford in Emilio Cavallini mantyhose. Jacob Tomsky from The Daily Beast wore them for a week and was not too complimentary. He gave them 2 out of 5 stars. Check out his article here. To learn more about Mantyhose, check out this website devoted to the new trend: www.mantyhose.net. Now, be truthful. Would you let your men wear mantyhose?